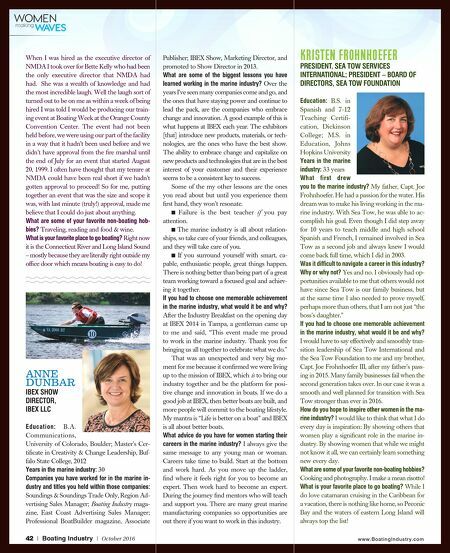 42 | Boating Industry | October 2016 www.BoatingIndustry.com WOMEN making WAVES When I was hired as the executive director of NMDA I took over for Bette Kelly who had been the only executive director that NMDA had had. She was a wealth of knowledge and had the most incredible laugh. Well the laugh sort of turned out to be on me as within a week of being hired I was told I would be producing our train- ing event at Boating Week at the Orange County Convention Center. The event had not been held before, we were using our part of the facility in a way that it hadn't been used before and we didn't have approval from the fi re marshal until the end of July for an event that started August 20, 1999. I often have thought that my tenure at NMDA could have been real short if we hadn't gotten approval to proceed! So for me, putting together an event that was the size and scope it was, with last minute (truly!) approval, made me believe that I could do just about anything. What are some of your favorite non-boating hob- bies? Traveling, reading and food & wine. What is your favorite place to go boating? Right now it is the Connecticut River and Long Island Sound – mostly because they are literally right outside my offi ce door which means boating is easy to do! ANNE DUNBAR IBEX SHOW DIRECTOR, IBEX LLC Education: B.A. Communications, University of Colorado, Boulder; Master's Cer- tifi cate in Creativity & Change Leadership, Buf- falo State College, 2012 Years in the marine industry: 30 Companies you have worked for in the marine in- dustry and titles you held within those companies: Soundings & Soundings Trade Only, Region Ad- vertising Sales Manager; Boating Industry maga- zine, East Coast Advertising Sales Manager; Professional BoatBuilder magazine, Associate Publisher; IBEX Show, Marketing Director, and promoted to Show Director in 2013. What are some of the biggest lessons you have learned working in the marine industry? Over the years I've seen many companies come and go, and the ones that have staying power and continue to lead the pack, are the companies who embrace change and innovation. A good example of this is what happens at IBEX each year. The exhibitors [that] introduce new products, materials, or tech- nologies, are the ones who have the best show. The ability to embrace change and capitalize on new products and technologies that are in the best interest of your customer and their experience seems to be a consistent key to success. Some of the my other lessons are the ones you read about but until you experience them fi rst hand, they won't resonate. Failure is the best teacher if you pay attention. The marine industry is all about relation- ships, so take care of your friends, and colleagues, and they will take care of you. If you surround yourself with smart, ca- pable, enthusiastic people, great things happen. There is nothing better than being part of a great team working toward a focused goal and achiev- ing it together. If you had to choose one memorable achievement in the marine industry, what would it be and why? After the Industry Breakfast on the opening day at IBEX 2014 in Tampa, a gentleman came up to me and said, "This event made me proud to work in the marine industry. Thank you for bringing us all together to celebrate what we do." That was an unexpected and very big mo- ment for me because it confi rmed we were living up to the mission of IBEX, which is to bring our industry together and be the platform for posi- tive change and innovation in boats. If we do a good job at IBEX, then better boats are built, and more people will commit to the boating lifestyle. My mantra is "Life is better on a boat" and IBEX is all about better boats. What advice do you have for women starting their careers in the marine industry? I always give the same message to any young man or woman. Careers take time to build. Start at the bottom and work hard. As you move up the ladder, fi nd where it feels right for you to become an expert. Then work hard to become an expert. During the journey fi nd mentors who will teach and support you. There are many great marine manufacturing companies so opportunities are out there if you want to work in this industry. 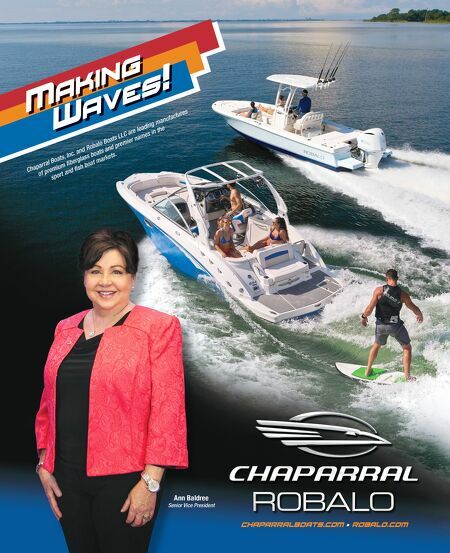 KRISTEN FROHNHOEFER PRESIDENT, SEA TOW SERVICES INTERNATIONAL; PRESIDENT – BOARD OF DIRECTORS, SEA TOW FOUNDATION Education: B.S. in Spanish and 7-12 Teaching Certifi- cation, Dickinson College; M.S. in Education, Johns Hopkins University Years in the marine industry: 33 years What first drew you to the marine industry? My father, Capt. Joe Frohnhoefer. He had a passion for the water. His dream was to make his living working in the ma- rine industry. With Sea Tow, he was able to ac- complish his goal. Even though I did step away for 10 years to teach middle and high school Spanish and French, I remained involved in Sea Tow as a second job and always knew I would come back full time, which I did in 2003. Was it diffi cult to navigate a career in this industry? Why or why not? Yes and no. I obviously had op- portunities available to me that others would not have since Sea Tow is our family business, but at the same time I also needed to prove myself, perhaps more than others, that I am not just "the boss's daughter." If you had to choose one memorable achievement in the marine industry, what would it be and why? I would have to say effectively and smoothly tran- sition leadership of Sea Tow International and the Sea Tow Foundation to me and my brother, Capt. Joe Frohnhoefer III, after my father's pass- ing in 2015. Many family businesses fail when the second generation takes over. In our case it was a smooth and well planned for transition with Sea Tow stronger than ever in 2016. How do you hope to inspire other women in the ma- rine industry? I would like to think that what I do every day is inspiration: By showing others that women play a signifi cant role in the marine in- dustry. By showing women that while we might not know it all, we can certainly learn something new every day. What are some of your favorite non-boating hobbies? Cooking and photography. I make a mean risotto! What is your favorite place to go boating? While I do love catamaran cruising in the Caribbean for a vacation, there is nothing like home, so Peconic Bay and the waters of eastern Long Island will always top the list!